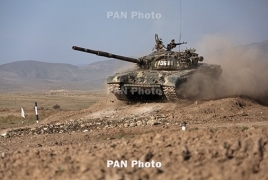 PanARMENIAN.Net - Armenia is planning to increase defense expenditures by 25% year-on-year, according to the draft budget for 2019. Addressing a Cabinet meeting on Friday, September 28, Finance Minister Atom Janjughazyan unveiled the proposed budget for next year, according to which the country will allocate AMD 307 billion (more than $625 million) to the Defense Ministry. From this sum, AMD 300.5 billion will be spent on military defense measures. The defense budget of 2018 had grown 17.6% against the previous year.